Hibernian FC Tartan Ribbon (Hibs Tartan Ribbon) is an extremely rare, premium tartan ribbon, officially licensed by Hibernian Football Club and produced as part of the Pride of Scotland range. 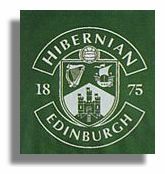 Hibernian FC Tartan Ribbon is available to buy in 16mm (5/8") and 25mm (1") widths only, on larger 50 metre (55 yard) reels. The Hibernian FC Tartan Ribbon sold by tartan-ribbon.com is top quality, authentic Scottish tartan ribbon as certified by the Scottish Tartans Authority. We stress that this is official Hibernian FC Tartan Ribbon, as licensed by the club. As you will see, the price of Hibernian FC Tartan Ribbon is considerably higher than most other tartan ribbon. 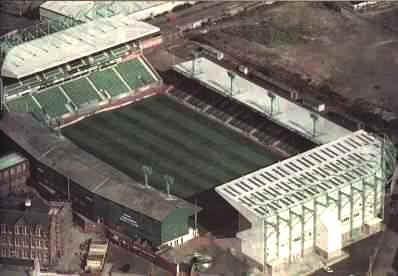 This is partly to do with licensing arrangements with Hibernian Football Club; the price set by the manufacturers and is, unfortunately, outwith our control. We believe our Hibs FC Tartan Ribbon is the most competitively priced you'll find but if you know better, or if you require different quantities, please don't hesitate to contact us.